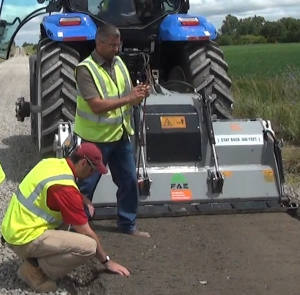 ISU’s Jeramy Ashlock and Pottawattamie County engineer John Rasmussen do a thickness test on a gravel road test section. When water receded from the massive 2011 Missouri River flood, Pottawattamie County gravel roads were buried in loess silt, the fine-grain soil of western Iowa’s scenic Loess Hills. To reopen the rural roads, the county wanted to do more than simply scrape off the loess along with the gravel and start over with all new material. How could they efficiently screen the existing gravel out of the silt and recycle it? No one had a practical solution, so the county rebuilt the road with clean material. The question, however, intrigued Iowa State University’s Jeramy Ashlock and Cheng Li. Ashlock, a researcher at the Institute for Transportation (InTrans) and associate professor in the Department of Civil, Construction, and Environmental Engineering, and Li, now a post-doctoral researcher, embarked on a study to better recycle gravel and return it to the roads. “This issue became a problem statement submitted by the Pottawattamie County engineer,” he said. “The research project evolved from the original idea of screening materials out of the road, to adding in other materials in controlled gradations while reusing the existing materials to give the best strength and durability. The researchers are developing an easier and better way for county engineers to measure the existing materials on their roads then use a spreadsheet under development to determine what mixtures of other granular materials are needed for optimal performance. A granular-surfaced road (a more accurate term than gravel road) may contain gravel and sand, silt, and even small amounts of clay—the “fines” or the finest size range of soil. A good granular mixture requires the correct gradation (size distribution of the gravel pieces) and the right plasticity (the correct amount of fines to hold the gravel together). With too much plasticity, the fines will turn into a muddy mess in the rain. With too little plasticity, the fine material won’t bind the gravel, which then tends to get bounced off the road by passing vehicles. In either instance, road maintenance and costs increase. Ashlock said not all gravel is alike. Limestone gravel from southwest Iowa, for example, tends to be soft. Hence, one size does not fit all, and the best gradation mixtures vary by location depending on locally available aggregate sources. The project used lab and field tests to determine a target gradation of materials for optimum strength. “We used what’s called Fuller’s Model, a particle size distribution model, to give us a target gradation,” Ashlock said. He said after engineers figure out the gradation of existing materials on the road, they can turn to the spreadsheet. The spreadsheet can determine the best mixture ratio of different materials to add in to get close to the target Fuller’s Model gradation to give it the best, long-term performance. “The idea is to optimize the gradation of what you put down on the road rather than just put down whatever you already have. This way, you can use some of the existing material for the new road. Ashlock and Li are testing different granular gradations on five 500-foot test sections in Pottawattamie County. They learned a key to optimum road performance was compaction. “We found that just adding vibratory compaction is a huge improvement,” Ashlock said. Lab and field testing took place before and after winter freeze-thaw cycles to see how the different material mixtures performed. Spring thaw is critical for testing because that’s when the material is at its weakest. The ISU researchers also are working on much simpler plasticity lab tests that county engineers can easily perform. In the end, the researchers want to provide county engineers with the tools to rapidly assess the current materials on their roads, and determine the best recipe for improved performance and longevity. Research funds were provided by the Iowa Department of Transportation and the Iowa Highway Research Board.